AdSense publishes policy guidelines - and prohibited content, to define the limits. AdSense works best when staying well within the limits. Like Blogger, AdSense requires blog owners / publishers to stay within the limits. We want to maintain a strong ecosystem for both advertisers and publishers. As a publisher, you are responsible for maintaining high quality inventory and traffic. People who stray outside the limits should not expect detailed coaching, which let them determine exactly what limits can't be exceeded. When you exceed the limits, you may not like the results. Bad news, seen by some too late. Dodgy techniques and traffic cause problems with both AdSense and Blogger - and both AdSense and Blogger will take action. For best results, read and follow required practice. 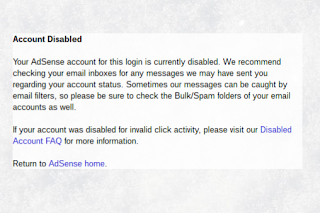 When an AdSense account is suspended, AdSense provides a Disabled Account FAQ. You can use the FAQ - but you'll do better to read the policies, and stay within the limits. You can appeal, after correcting a problem - within limits. You'll find limited support for appealing - even after identified problems are resolved. Thanks for contacting Google AdSense. According to our records, you already appealed to us twice in the last 30 days. Due to the volume of appeals we receive and as indicated in our help center you can't appeal more than twice per month. If your previous appeals have been unsuccessful please remember that our actions are the result of careful investigation by our team of dedicated specialists, taking into account the interests of our advertisers, publishers, and users. 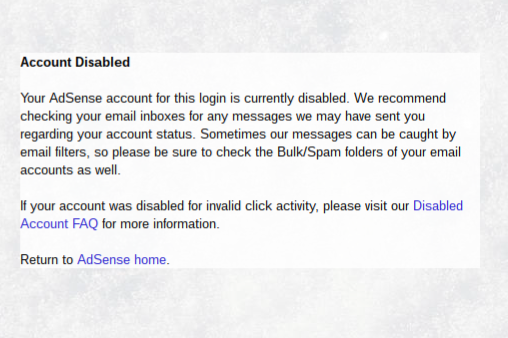 Though you might be disappointed with our decision, we are unable to reinstate your account. If you have new information which may have helped us to reinstate your account then you are welcome to submit another appeal next month. An effective appeal requires two definitive details. Describe what you are doing to prevent its recurrence. The best action will be to read and observe published policies. Like #Blogger, #AdSense does not provide detailed advice, or advance warning, about unacceptable content or practice. AdSense publishers are simply expected to read their policy documents - and stay well within the limits.